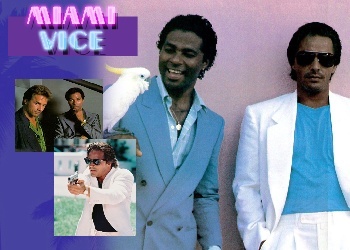 A Miami Vice suit is certainly a good way to get some attention. I’m not sure I’d want to wear one out today, but for a costume party it can be a winner. Jacket – Most people remember the classic white jacket that Don Johnson used to rock. There were a few episodes where there were some shiny blazers but that wasn’t until a little later in the show. Surprisingly, many European designers were the source here, including Armani . Versace and Hugo Boss were also big. Pants – Again, white linen all the way. I noticed Johnson also had some nice peach or apricot pants too, so those colors can work. T-shirt- You need to have a nice dark t-shirt. Black is the best, but a purple or dark grey can work. Sunglasses – Black Ray-Ban Wayfarers were used on the show, but any black sunglasses will do for the most part. Shoes – These are the tricky part. The show featured sockless slip-on loafers, usually white to match the pants. I can’t imagine what the smell would be like after a while in hot Miami. The 2006 movie had the same edginess, but was much darker. Director Michael Mann got away from a lot of the pastels and bright lights. There were still designer labels everywhere, including Kiton. Supposedly they supplied a lot of the suits for Colin Farrell, who played Crockett.